I’m trying to emulate the shift distortion with a VST. I’m using the Robin Schmidt FuncShaper VST with an absolute value function and high pass filter(to get rid of DC offset). Getting close, but there’s just a little bit of extra grit with the shift distortion, even when I’m just about matching levels. Can anybody shed some light or provide conjecture on the implementation? – followed by a auto-DC filter. The Drive parameter modifies the shape. 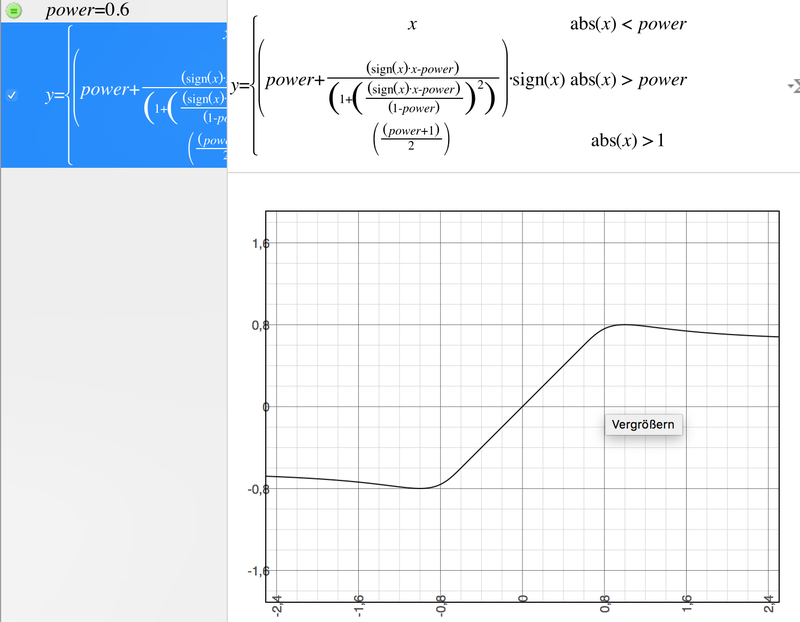 See plot on wolframalpha how the drive parameter modifies the shape. Thanks taktik! Any chance you would also share the exact “shape” soft-clipping algorithm? @gentleclockdivider are you referring to me? I would like to know the exact algorithm of the softclipping mode of the distortion plugin, so I can accurately reproduce it in lua prototype for converting my songs. Hm, using Reaktor for this would be fine, too. 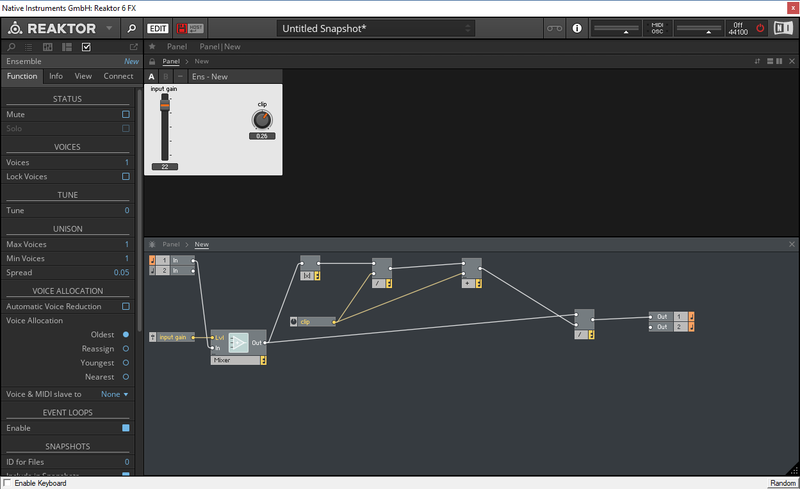 I wasn’t aware that you can go down to such an algorithmic base level in Reaktor. I cannot see anything on your screenshot btw., way too small. Once you name it “simple distortion”, once you name it “soft distortion”. So I assume you are referring to the first mode of the distortion plugin, which is a hardclipping or something? 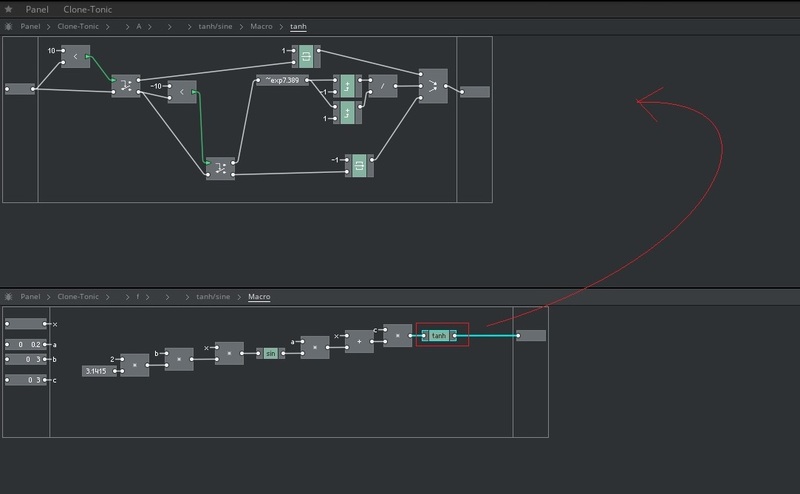 How do you think all the new zdf filters are made , exactly , in reaktor core! Search for “soft”, “saturation”, or “waveshaper”, and you’ll find a bunch of different examples that should do the trick. Thanks! Is Reaktor also good performance wise? Does it support VST3 maybe even? Still don’t get this one. I mean the distortion mode “Shape” in Renoise 3.1.1. The point is I need the very exact, 100% accurate formula to exactly be able to recreate the same mixing result in another daw. Just like Sisyphus. Oh nice, in new design. I thought it was gone. Any idea how I can check a value if it is undefined yet in macOS Grapher? 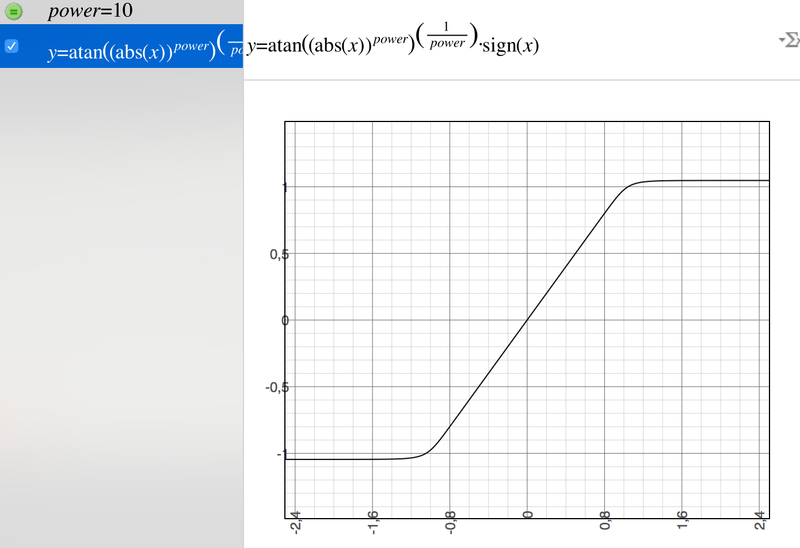 I mean, how can I realize f’(x) in Grapher? But I need exact formula, please. 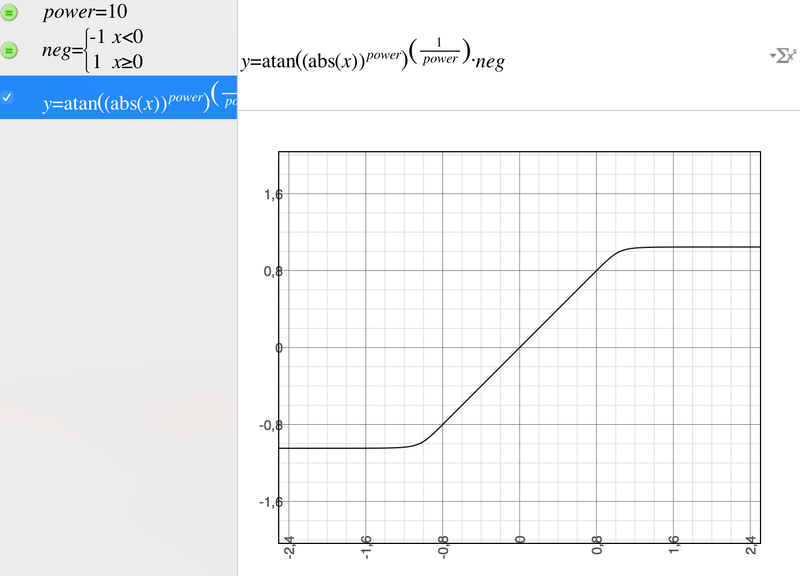 Why is a = 0.26 ? It is very kind of you that you want to sell me your algorithm. Yet my original question was a different I want the EXACT algorithm, not a cool distortion algorithm. 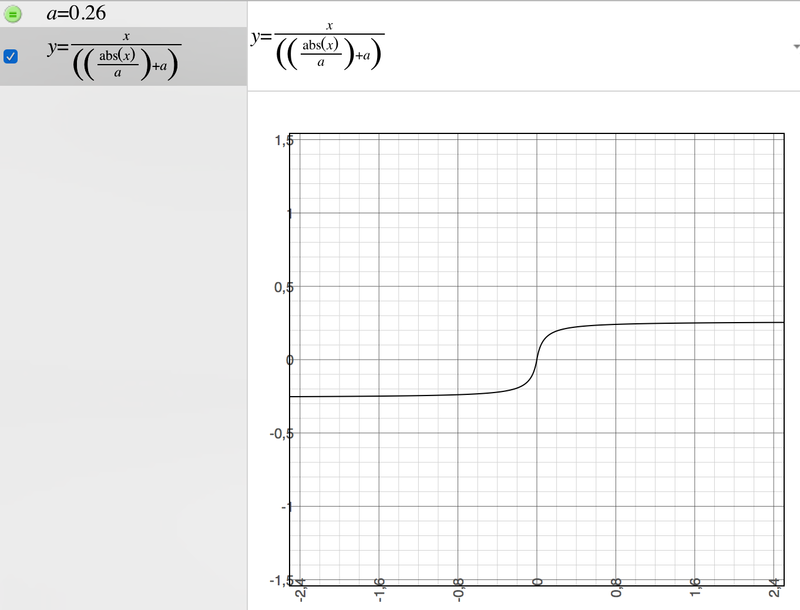 At pre-gain = 0, that kind of result, the soft clipper, just exactly reacting as in Renoise. 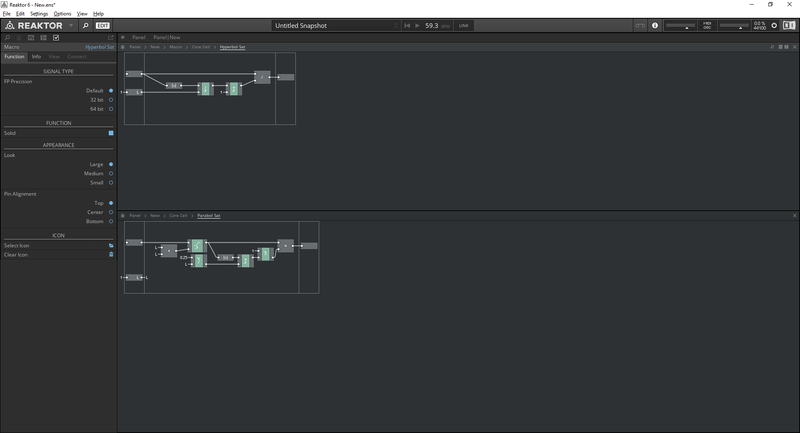 @gentleclockdivider Does Reaktor 6 provide some kind of scripting, too, similar to formula device? LOL seems like the concept has gone a bit too strict. Lot of elements for a simple math equation. And this is the inside of a tanh module .